This tab () is used for copying maps to your devices. 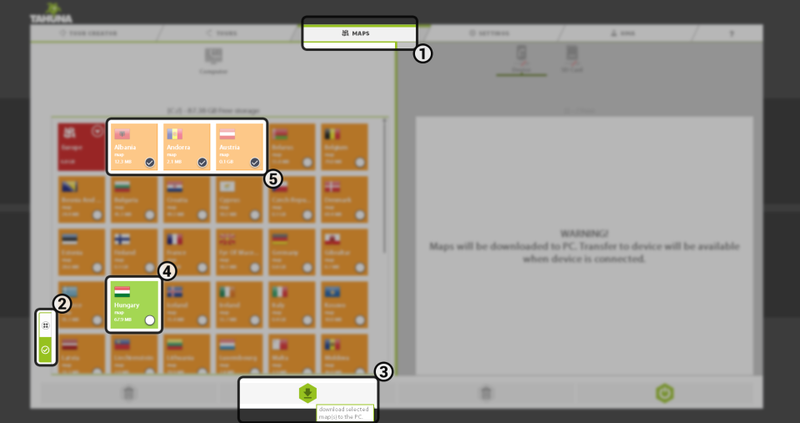 The left pane shows the available maps grouped by regions/continents. You can expand these by clicking the arrow at the top right of the tiles. Once expanded, the contained country maps are shown. (In case you don’t have a device, you can still download maps – in this case clicking and holding a tile will activate the ‘Selection mode‘ (). Select the desired countries and click the Download () button at the bottom of the screen. To transfer a map to your device, drag it from the left pane onto the right and simply drop it (if you have selected the SD card instead of the device, the maps will be copied there). This can also be done by selecting the desired map (clicking it will change its colour from dark to light orange). A progress bar will appear on the tile showing the amount of data already transfered. The maps copied to your device will turn from orange to green () within the left pane. To delete a map from your device, select the desired one and click the Delete button at the bottom of the screen. You can select multiple maps by clicking the Tick () button at the bottom left of each tile (), then selecting the desired maps. To select all of them, click the button with the four dots () just above the tick button mentioned before. Selection mode can also be activated by clicking and holding a tile.